Tension between Israelis and Palestinians was quickly escalating when Linford Stutzman ’84 (Seminary ’90) traveled to the Middle East in the summer of 2000 to prepare for his first turn leading EMU’s cross-cultural to the region. By the time he and his wife, Janet Stutzman (Seminary ’91), arrived with the group in early 2001, the second Palestinian Intifada, marked by frequent violence between the two sides, had begun; the group heard nightly gunfire during its stay that winter in the West Bank. 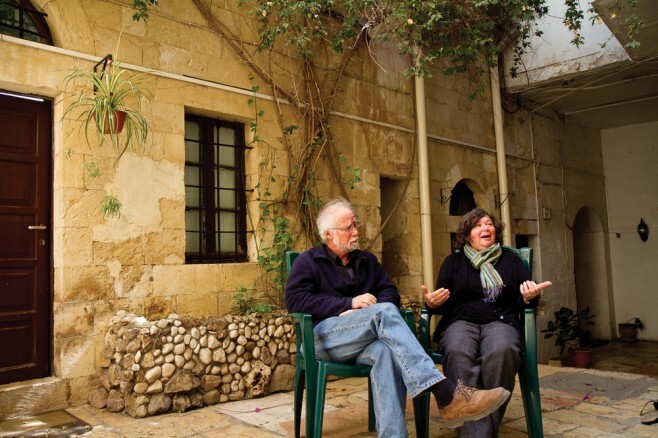 Looking back more than a decade later, the Stutzmans say it’s amazing EMU let the Middle East cross-cultural continue through that time of upheaval. It was a decision that paid off, however, as it led to deeper relationships with the program’s partners in the region, who remember and admire EMU’s commitment to cross-cultural education through thick and thin. EMU was the only American university that didn’t cancel programs with several of these partner institutions. The Stutzmans, who lived through the 1973 Yom Kippur War while working as independent volunteers in Israel, emphasize that risk-taking doesn’t equate to recklessness, and that careful planning for contingencies is a part of each of the trips to the Middle East that they’ve led. “We’ve gone into it with our eyes wide open … our agreement with EMU was that we would work with our local [contacts] and make safety decisions based on that,” says Janet, director of alumni and parent relations at EMU from 1991 until 2004. And so, through the first Palestinian Intifada in the late ’80s and early ’90s, the tense months before the Gulf War in 1991, the second Intifada early in the new millennium, and the Arab Spring and new talk of war between Israel and Iran over the past two years, the trip has continued uninterrupted since Willard and Mary Swartley led the first Middle East cross-cultural in the spring of 1975. In doing so, Janet and Linford say, students experience the volatile nature of day-to-day life in the Middle East, while learning valuable lessons about interdependence, self-reliance and the value of taking wise risks throughout their lives. Since 2001, the Stutzmans have led eight cross-culturals to the Middle East (on two occasions, when Janet’s work in Harrisonburg prevented her from being along for the whole trip, their son, David Stutzman ’00, filled in as a co-leader). Throughout the planning process as well as the trips, Aracena has worked closely with the Stutzmans and the university administration to monitor developments in the region and, if necessary, change plans when certain risks no longer seem wise. One recent example of this is EMU’s decision to scratch a previously planned visit to Syria from the itinerary for its 2013 Middle East trip (the Stutzmans led a smaller-than-usual group there for the first time in the spring of 2011). Aracena describes Linford and Janet as “an absolutely phenomenal pair,” constantly tweaking and improving the itinerary to keep the trip new and on the cutting edge. The wisdom and obvious enthusiasm the Stutzmans bring to their roles as leaders has endeared them to each new group of students they take to the Middle East. “They are such complementary leaders,” she said. According to the International Institute for Education, just 1.8 percent of American students studying abroad in 2009-2010 went to the Middle East. With EMU’s long academic ties to this region infrequently visited by American university students, the Middle East cross-cultural has developed into a special niche program for the university and its students, Aracena says. Because of high student interest in the trip, the Stutzmans have been leading it each spring in recent years. “It is just an exceptional learning opportunity for our students,” Aracena says. Outreach to students’ families is another important aspect of making the trip successful; the Stutzmans and Aracena have regularly responded to questions and concerns from worried parents. Talking with them about the careful planning and collaboration with Palestinian and Israeli partners throughout the trip usually allays parents’ fears. Unfamiliar risks (say, studying abroad in a place typically associated with ominous headlines) often are scarier than familiar risks (e.g. driving to the airport) the Stutzmans say, even when, in fact, statistics show that the drive to the airport is the far riskier undertaking. As parents learn more about the trip, they often say they wish they could have a similar opportunity to visit the Middle East. The Stutzmans – who have also spent nearly every summer since 2004 retracing Paul’s Mediterranean travels together by sailboat – need little encouragement to plan new adventures, and so, in the summer of 2011, they led 14 EMU parents and alumni on a unique “parents cross-cultural.” On that trip, they compressed the usual itinerary into a 16-day tour of Israel and Palestine, affording Linford and Janet yet another opportunity to teach others about the people and places they’ve come to love over the years. Each new group has its own personality, the Stutzmans say, and each student returns home with a changed view of God, of the world, and of themselves. 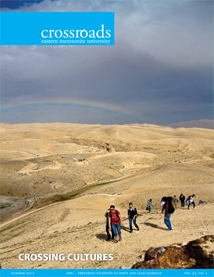 By having agreed to lead the Middle East cross-cultural each spring through at least 2015, Janet and Linford will continue influencing dozens more EMU undergrads over the next several years by exposing them to the conflicts and contradictions, as well as determined hopes for a better future, that exist throughout the region. Perhaps most formative, they say, is the fact that EMU students on the trip interact with and learn from people who hold wildly divergent views on religion, politics, security, justice and other issues of fundamental significance. At the same time, the students’ immersion in day-to-day life in the region leads to deeper, human connections with the people they encounter. One Response to "Web Exclusive: Risk-Taking: A Metaphor For Faith And Life"